The earlier chapters of the translation might be a bit rough, but i promise as the story progresses, the translation quality also increases greatly! So just bare with it.. and dont give up such a great story…! The philosophy of socialism, the controversy of nature, German, advanced engineering mathematics, mechanical engineering, software and computer engineering. Wait, I forgot to finish engineering mathematics. Damn, Old Devil Zhang’s going to have my head! Zou Liang (Zōu Liàng) woke out of his sleep with a distressed scream, fumbling in the darkness of the room, the heaven shaking snores of a heavy weight person shook the realization that he no longer needs to do homework ever again. The heavy weight person was unaffected by Zou Liang once again abruptly waking up at midnight. Zou Liang speculated that this brother of his would be unaffected even if heaven’s tribulation were to come. Zou Liang had a hard time sleeping because of this heaven shaking snoring; precisely speaking he is now called Ya Se – Xi Bo Lai (Yà Sè – Xī bó lái). Subconsciously he reached for a cigarette, realizing there were none he tucked both his hands behind his head. He couldn’t help but sigh, thinking how his mundane life had taken such an amazing turn. Zou Liang, Male, 182 cm in height, graduated with a master in mechanical engineering from a second-rate university in the magical capital. After graduating, he worked for a brief amount of time, later entered the ivory tower as he found that only by being a student could he peacefully play games. Specialty: Playing competitive computer games (TL: E-Sports). This seems like the only thing that Zou Liang could bring out to show (TL: had achievements in?). He had practiced Tai Chi 1 for a few days, learned a bit of martial arts, randomly learned a few techniques in Taekwondo 2; all for the purpose of improving his gaming skills. He had also read a decent amount of rumored lost martial arts, the kind that sold off 10 dollars a book. Of course, he could not perform any of these martial arts, his sole pride being CG3D’s (TL: I guess this is the game name) three-time consecutive champion. As for the future, He had never thought about that…. This was how things were, in the year 2011 the first day of snow came slightly earlier than expected. Seeing that graduation was in the view, 27-year-old, old man Zou Liang decided to cheer up and give his fighting game a final farewell match. He intended to use this match to tell his fans that he was going to retire, however, due to an unfortunate turn of events, he not only bid farewell to his fans but to the internet cafe and his life in the explosion. The next time he woke up, he had arrived in this mysterious world, in the Bi Er (Bǐ’ ěr) household of the Bear Tribe. He was very satisfied with his body, his height was similar, surprisingly he had his past life’s memories. His build among the Bi Er was considered thin and scrawny, frankly speaking, people with his build are unpopular and disregarded. His brother Ou Nisi Te – Xi Bou Lai (Ōu Nísī Tè – Xī Bó Lái) who was soundly sleeping beside him has a lot in common with him. Brothers unrelated in blood but adopted as they were both orphans. However, the old man who had adopted them had passed away the year before. Fortunately, the old man had left them some money which allowed them to maintain their current lifestyle at the War Academy along with Ou Nisi Te’s wage from heavy labor jobs. 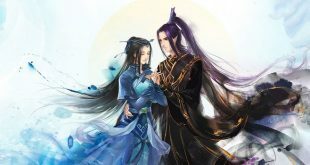 Ou Nisi Te is a very straight-forward and simple person; in Zou Liang’s world he would be called all brawn no brains 4. Or to be very frank, just stupid. In this beast men dominated world, this continent is called the Ameng Continent (Āméng), located in the Meng Jia Empire (Méng Jiā). Beastmen were not like animals, as such, streets were not full of hairy, fluffy animals. They were more akin to human hybrids the main notable difference being that every best men have a spirit mark imprinted on their foreheads, unique and distinguishable to their race, it is said to be a gift from their gods and ancestors, simply said it is an imprint that has special uses. Zou Liang reluctantly accepted the tattoo though it conflicted with the principals that he had been taught since childhood, as when in Rome do as the Romans do (Chinese idiom meaning is to follow the traditions of the local village). However, the purpose of this beast spirit mark imprinted on Zou Liang was likened to a headache, as his previous self-was very concerned about this imprint. How do we start… It could be said that it was because of his weak stature he worked diligently to prove himself, but also that the sole dying wish of his adoptive parent was that he would become a powerful Bi Er Clan warrior. Therefore Ya Se had used most of his time training to win a battle in the beast spirit world, as it is a symbol of becoming a warrior. As a result of this desire, Ya Se had lost 81 matches in five years and had all of his beast spirit powers taken from him. When Zou Liang reincarnated into the body, he had experienced Ya Se experiencing his last loss, finally departing from this world. The memory of the promise was so deeply ingrained that even Zou Liang who had taken over the body only felt misery when recalling that scene. He admired his predecessor’s persistence . However, he couldn’t help but feel that his method was far too stupid. The Meng Jia Empire was not an undeveloped barbarous empire, on contrary, it is extremely well-developed. Its situation was very similar to our current day’s Europe, the importance of the War Academy was akin to that of Zou Liang’s society. In this world that is ruled by martial power, Zou Liang didn’t dare to have any ambitions and only wished to live peaceful, stable days where his identity would not be revealed. Counting each day as it passed; returning wouldn’t be bad either. Zou Liang hazily fell asleep ignoring the snoring, he dreamed of each and every moment that Ya Se was knocked down and left in the miserable state, which added to Zou Liang’s disturbed mood. Since you’re gone, go in peace, it’s not that this older brother doesn’t wish to help. However, your qualifications are inadequate; it’s truly like a clay Buddha crossing a river. 7 8. As dawn broke, Ou Nise Te was already training; in the past, it was always Ya Se who had to wake him up, but recently his older brother had been sleeping deeper. This wasn’t the whole reason as he had also been practicing a new type of martial arts. Ou Nise Te regarded his older brother with deep respect as his older brother was smart; he believed that his older brother would one day become a valiant warrior. Maybe Ou Nise Te was the only person left with this naive thought. Zou Liang slept until he naturally awoke in their shabby dwelling. However, this was natural as they could barely afford the first year of tuition. As for the coming year, there was no telling where they would end up. He was already working as a part-time librarian which to beast men was a lowly job that no one was willing to do, but to Zou Liang, it was a pretty decent occupation. He could take naps; he also didn’t have to fight with strong and powerful people; it was truly a blessing. The Meng Jia Empire has eight major provinces; Ya Se lived in the Southern parts of the prosperous city named Ye Lu Samo (Yē Lù Sàmó) which is a first-class major city in the holy province. The War Academy in the Ye Lu Samo provides the city with a shrine and a spirit engraving master, upheld as the third mega-structure in the city. By owning two large systems of combatants and noncombatants. Archers, assassins and war song priests would choose the path of armour transformation, following one’s occupational strengths to initiate beast transformation at the same time. On the other hand Berserkers thread solely down the path of beast, transformation becoming a fierce beast man warrior. This offers them frightening combat strength however advantages and disadvantages come hand in hand, lacking the techniques and control that a Crusader has. Crusaders are able to transform into an armored warrior and are upheld as a more noble occupation 12. This is an occupation similar to archers, assassins, and war song priests that require armor transformation as well as a suitable weapon to display the full potential of the occupation. It is easier to directly increase battle power by beast transformation, however, to initiate armor transformation is a bit more complicated as it requires the aid of a spirit engraver. It is a taboo to raise the topic of a spirit engraver, as this is a supremely divine country, engravers are revered as a noble existence. No one would offend a spirit engraving master as the spirit engraving guild is ** an extremely powerful existence 13. Because every beastman needs a spirit engraving master to transform their beast spirit into their desired shape. However, a spirit engraving master can also predetermine the success, failure, and quality of the finished product. Beast transformations breakthrough once the beast spirit mark has accumulated to a certain degree, at this point one may seek a spirit engraving master to guide them through the breakthrough. The armor transformations change is a molding process, under the help of a spirit engraving master, they revolve the beast spirit from the helmet to the armor suit, bracers (arm guard), greaves (leg guard), shield and weapon sheath. Imbuing and changing every individual piece of equipment is much more complicated than it seems. Armour transformations advantages are that it is based on the properties of the occupation to be initiated. It brings out the strengths of a person’s build and talents. For example, the focus of an archer will be to use their beast spirit to form an excellent set of bow and arrows, whose attributes will also be focused on agility. Assassins will emphasize on a dagger or a claw with their attributes accenting speed and agility. War Song Priests need divine power, therefore, their focus is on the helmet. Divine power may be used to increase the range or spread of their techniques as well as having the ability to raise one’s spirits. This is the reason that the Crusader class is a luxurious and elite class as it is balanced being decent in all areas. However this requires a lot of beast spirit, therefore relying on one’s own growth in beast spirit is not enough, it also requires the best possible spirit engraving master, or else without the spirit engraving master everything else would be a waste. Obviously once a Crusader achieves the silver grade, their fighting power would be enough to frighten anyone. Therefore this was the primary choice of nobles. Another advantage to Armour transformation was that it is very dashing. For the majority of female beastmen, vanity induced deep thoughts. Therefore females of the berserker occupation are rarely seen, most females become archers, assassins, or war song priests. For example, it would be rare to see a berserker from the Bisi (Bǐsī) Swan clan, of course from their social standing it is very appropriate. All of this was very far away from the Xi Bo Lai brothers, Ya Se’s beast spirit never accumulated to the threshold to be able to breakthrough as all of it was lost through battles. Sometimes Zou Liang thought it was weird, because if Ya Se had not fought as much, he could have accumulated enough to break through the threshold a few times, but alas sometimes the Bi Er tribe was blockheaded and single-minded. On contrary Ou Nisi Te had obtained two breakthrough chances. However, both had failed. Honestly speaking Ou Nisi Te had no chance of succeeding at something so profound as breaking through without the guidance of a spirit engraving master. But with their current situation, it was impossible to invite even the lowest level plain spirit engraving master to guide him.